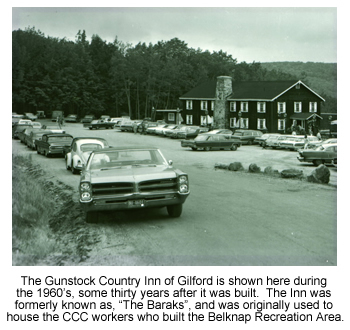 For the present-day owners of the Gunstock Country Inn and Fitness Center, ownership of one of Gilford’s working pieces of history has become like taking possession of a time c apsule. Richard, Maurine, Ed, and Louise Bastille bought the Inn in the spring of 2006 and, as a family, have worked hard to create a warm and friendly atmosphere, which focuses on down-home, family-oriented fun. The Inn began its life in the late 1930’s. It was built to house the CCC workers who helped create the Belknap Recreation Area, which is now known as Gunstock Mountain Resort. The building itself was much smaller than it is today, with a single, central fireplace which served as its only source of heat during the cold winter months. There were no individual rooms, but rather just bunks surrounding that large, fieldstone fireplace. In keeping with the necessary frugalness of the Depression Era, wooden beams and timber were brought in from other dismantled structures and were recycled into this new building called, “The Baraks”. The Baraks was as basic as any structure could ever be. Richard, while proudly giving a tour of the Inn, showed off framed photos of the interior of the rustic building. “Judging by the fact that there are four or five blankets piled up on each bunk, they must have been a hardy lot to have stayed here,” he said.